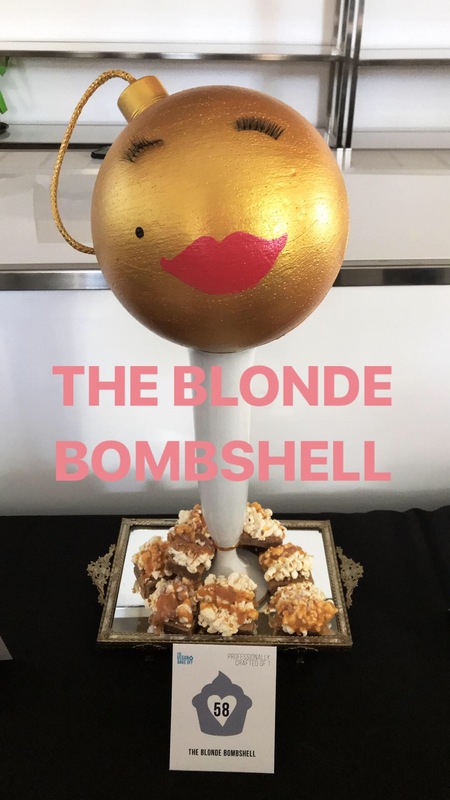 If our Monroe Blondies are named after pin-up queen Marilyn herself, then these award winning treats are truly a Blonde Bombshell! Snickerdoodle blondies topped with popcorn, vegan marshmallows, coconut milk caramel candy (which you make!) and Maldon flaked sea salt. Let’s get baking! 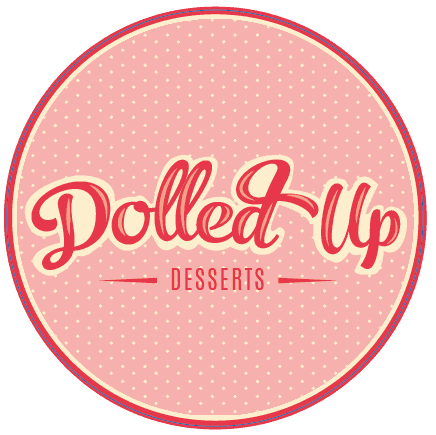 I’d have to say that our team at Dolled Up Desserts is very competitive. We know we do something special with our treats, and like to share that with the world whenever we can…. Especially if we can win awards for it. The Toronto Vegan Bake off is in its 10th year- 10 YEARS! It is run each year by the volunteers at the Toronto Vegetarian Association (who we love so dearly) as a fun way for amateur and pro bakers to share delicious and innovative vegan treats with the community, as well as encourage friendly competition. We were lucky enough to enter in 2017 and WIN for our Lavender Lemon Short Bread Cookies. We decided to up our game and try again this year to wow the crowd with some more fantastic inclusive dessert. And boy, did we deliver. Presenting this years Vegan Bake Off best Professionally Crafted Gluten free and Vegan Goody- the Blonde Bombshell. The Blonde Bombshell, fittingly named after the pin up queen Marilyn Monroe, is our signature Monroe Blondie Premium Baking Mix spiced with cinnamon into a snickerdoodle base. 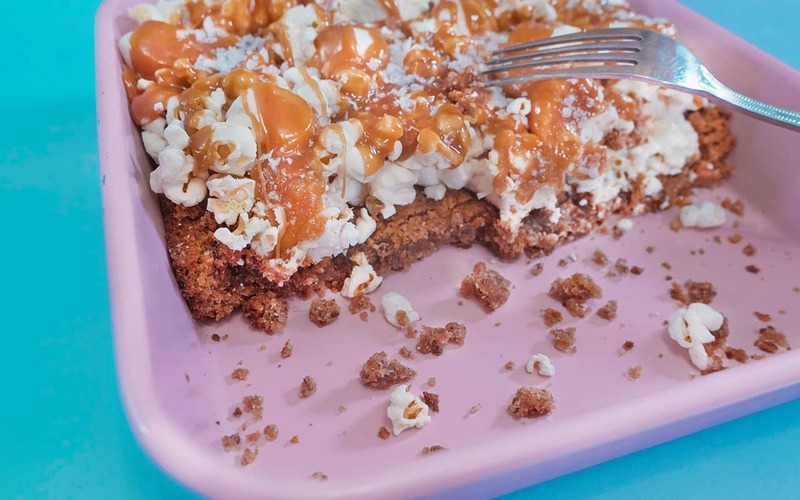 Then the fudgy blondie is topped with marshmallows, popcorn, coconut caramel candy and flaked sea salt. The taste and texture juxtaposition of this treat is mind blowing, like a bomb in your mouth (hah hah). The unique learning piece of this recipe is the coconut caramel candy. Soft caramels are typically made with cream and butter. An identical version of soft caramels can be achieved quickly and easily using coconut condensed milk. So long as you are stirring occasionally and keeping an eye on this, you will end up with perfect soft caramel each time. This can be used on top of ice cream, cakes, in cookies, and more. Although slightly harder to track down, ask around at your local health food or bulk stores for coconut condensed milk. To make your own coconut condensed milk (not even the caramel), it takes epic amounts of sugar and hours of boiling time. Save yourself the hassle and find the condensed stuff. If you are having trouble finding it, message us or comment below and hopefully we can help you find it. Anyways without further ado, here’s our award winning baking mix recipe. We hope you enjoy baking it! Preheat oven to 350°F. Grease 9x9 inch pan with coconut oil. Prepare blondie mix as directed on package. Bake blondies for 15 minutes. Remove blondies prematurely from oven and pour marshmallows on top of blondies. Place blondies back in oven and finish baking for another 15 minutes. Remove blondies from oven and work quickly to carefully press popcorn into the melted marshmallows. If the marshmallows are not as goopy as you would like to hold the popcorn together, use a fork to pull the mallows apart. The marshmallows hold the blondie and popcorn together. Let the blondies rest until cooled. While the blondies are cooling, pour coconut condensed milk into a small sauce pan. Heat on medium high heat for approximately 5-7 minutes and stir occasionally. You need to watch the coconut milk carefully during the heating as it will gradually change states from a sweet runny milk into a dark caramel brown. You can visually tell the caramel has been made when the bubbles in the sauce start to retain their shape and don’t pop as easily (I like to think of it as warts on a toad, I know gross). You also will know the caramel is ready to go because you can scrape the boiling caramel off the side of the pot with ease as your stir it. It overall is much thicker than what you started with. Once the caramel is ready, you must work very quickly. Turn off the heat and bring your blondies to the stove top. Pour quickly but carefully the caramel directly from the pot to the top of the popcorn. It will solidify within minutes so once you have adequately caramelized your blondies, sprinkle and press the flaked sea salt into the caramel. Remove blondies carefully from pan, or just cut and serve directly from the pan. You will want to use a very sharp knife for this, as the caramel is very difficult to cut through. You can also let the blondies sit overnight in the pan and the caramel will soften slightly, making it easier to cut the blondies the next day. You can store these blondies on the counter in an air tight container for up to 48 hours. You definitely need to eat these immediately as the popcorn does go stale after that. These cannot be refrigerated or frozen without losing the crispness of the popcorn or disintegrating the caramel. I know, finicky, but frankly it means more dessert to share!